Have your customers carry out their garments in style and promote your brand. 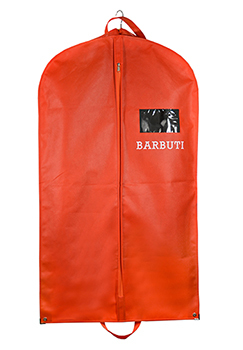 Garment bags are an attractive and reusable packaging solution for suits, coats, dresses and gowns. They are ideal for protecting garments on the way home or when traveling and at the same time advertise your brand. We can design custom garment bags in a variety of materials. From lightweight to the luxurious, there are many material options – PEVA, nylon, non woven & cotton. We can match colours, add a pocket, carry handles, grommets, snaps , and other finishing touches such as contrasting stitching and much more. You can rely on our expertise to help you design custom garment bags that suit your purpose and represent the image of your store. As a bridal salon, you will likely need gown bags based on different styles of dresses that you sell. We offer custom solutions for all – even bags that fit the “larger than life” wedding gown. 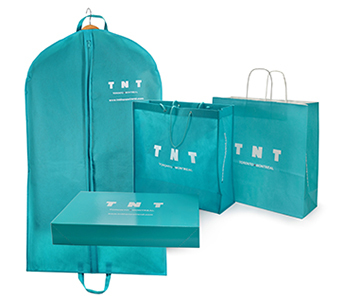 Non woven gown bags have become the preferred choice for carrying out your gowns in style, whereas clear vinyl bags continue to be used for in-store displays. Need a more cost effective solution for seasonal sales? Why not go for custom printed poly garment bags on rolls. They are available in many colours and very convenient to use. Whatever your requirements are, we can assist you in designing bags that will leave a perfect impression. We invite you to request a price quotation or contact us now. Please call 416-739-1818 or 1-877-723-5701 or email us today. Need only a small quantity of branded garment bags? No problem! 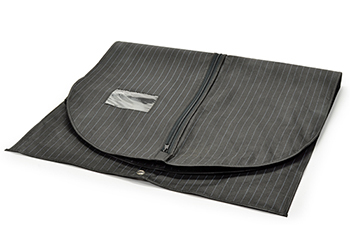 We have a solution for you – you can customize most of our in-stock garment bags. You will likely be surprised by the variety of affordable options.